I love one-pot cooking. I’ve embraced it as my go-to technique for those times when I just have no time. When I cook, I’m anything but neat. My husband says when the kitchen looks as if a typhoon has passed through, he knows I’m happy, working on some culinary adventure and something delicious is likely to soon emerge. Admittedly, I often try to do too much at one time. Although I try to clean as I go, sometimes it’s just not practical nor enough. So most of the clean-up happens when I’m done cooking. I then put everything away to its proper place and clean the counters and floor, leaving the overwhelming task of washing the sink full with pots and pans until the end. Sometimes, that’s also when my husband lends a hand and tackles the beast for me. But there are some days when I’m tired and don’t want to deal with the colossal mess. There are times when I want to cook, but am not interested in pulling out several pots and pans to make one meal, or when I certainly am not in the mood to spend all day in the kitchen. It’s during those days when I turn to the one-pot cooking technique, great when I have a lot of other activities, besides cooking, competing for my time. 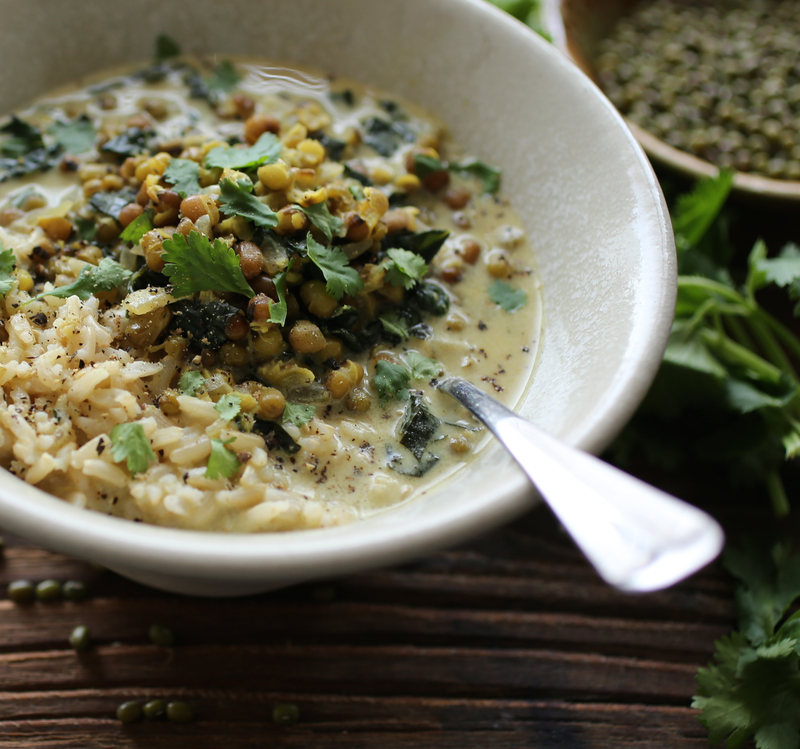 This hearty Mung Bean Soup is a great example of something to whip up during those times. It’s not only easy to make, but also tasty and nourishing, especially during cold winter months. In a large soup pot, heat the oil over medium heat. Add the mustard seeds. When the seeds begin to pop, add onion and sauté until translucent. Then add garlic, ginger and stir until fragrant. Add all the spices. Stir well. Add beans and 6 cups of vegetable broth or water. Bring to a boil then allow to simmer until beans are tender, about 40 minutes, adding more broth/water if necessary. When beans are cooked, taste and adjust seasoning, adding more salt and pepper if needed. Add kale and cook for an additional 7-10 minutes. Remove from heat and add coconut milk, if using. 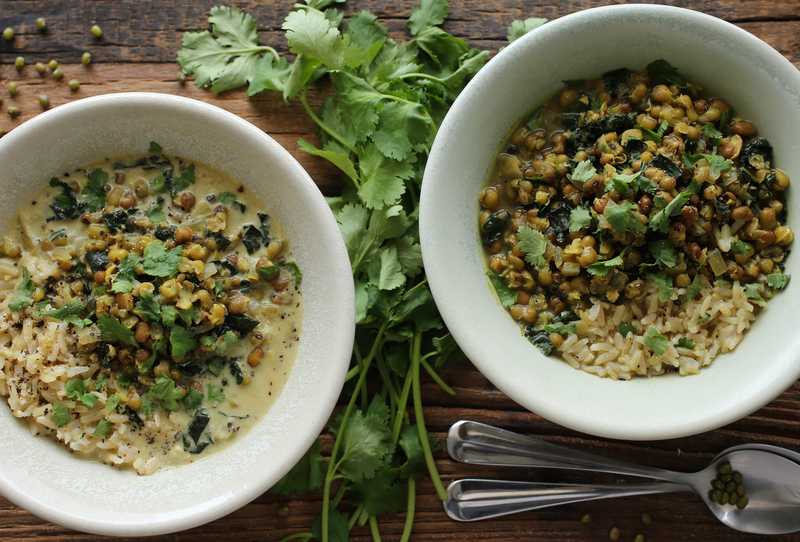 Ladle into bowls and serve as is or with brown rice, farro or any bread or grain of choice. 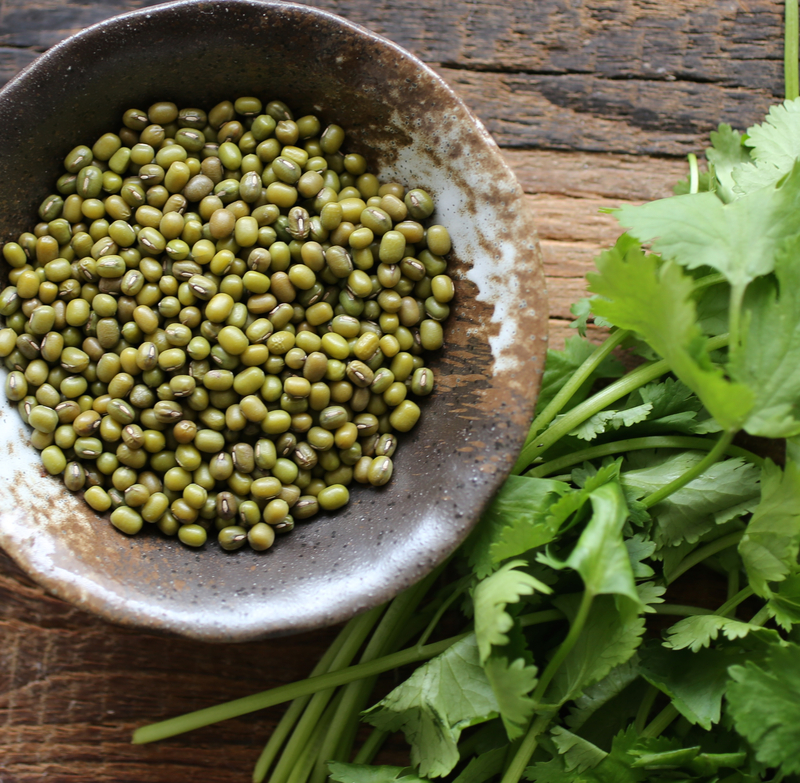 Notes: Many say that whole mung beans don’t require soaking prior to cooking. Although this is true, I find that the beans are easier to digest and faster to cook if soaked the night before. If you don’t have time to soak your beans, but would still like to make this soup, feel free to go ahead, just plan to cook them a little longer (perhaps a little over an hour). In the photos above, the first picture features the soup without coconut milk, the others are a creamier version with the coconut milk. Both are delicious. For those who like spicy foods, adding a chile pepper or a dash of pepper sauce might be a desired option. This looks wonderfully warming and the spices with the coconut sounds fabulous! Thanks Millie! It was delicious with the coconut milk! Thank you! I forgot to mention that adding chile is also a nice option. I made this today for lunch and we ate it over seasoned brown rice. 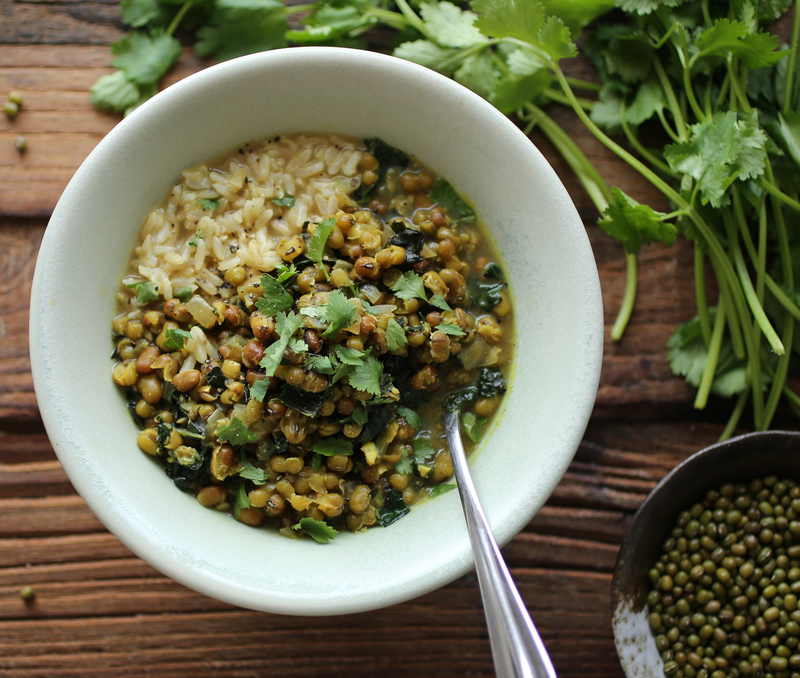 I didn’t have any mung beans, but I made it with lentils and it was delicious! I also added one chopped jalapeno pepper. I’d love to try it with mung beans sometime, but my husband and kids are already on board, as it is. It’s -5 degrees F here today, so this warmed us up nicely. Thank you for the recipe! Hi Emilie, you’re so welcome!!! I’m glad you tried this recipe and that it worked well for you and your family! Thanks for letting me know. Your substitution with lentils sounds great. I love lentils…. Thanks again for commenting. Stay warm! I made this for some friends last night and we all were obsessed and devoured multiple servings! 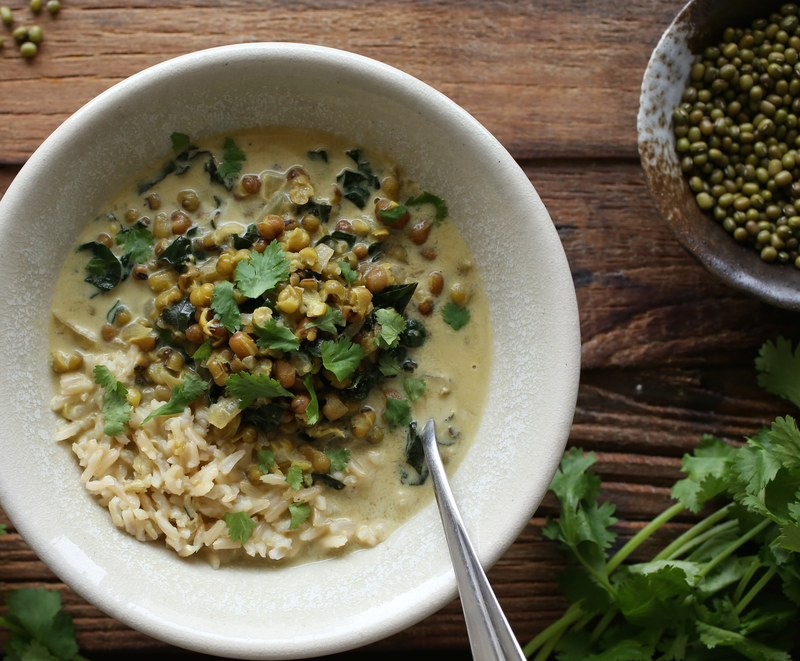 First time trying mung beans for all of us and we loved it. So flavorful like all your recipes. Thank you! Thank you Sam! So happy to hear you tried this soup with friends and enjoyed it!